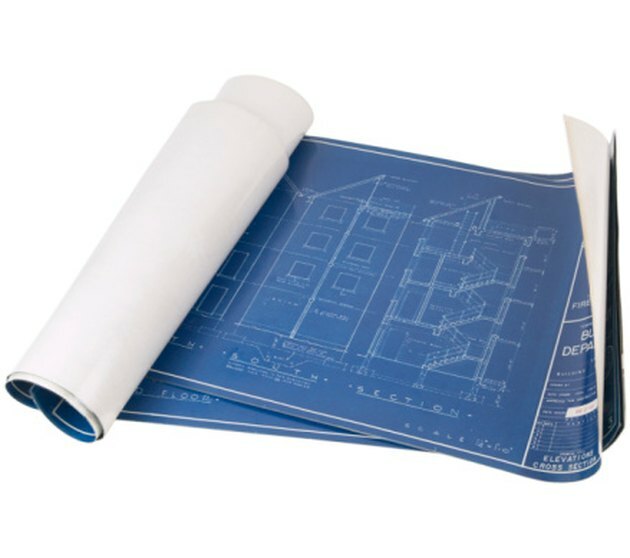 Blueprints are visual aids used by architects, construction workers and designers to see how their projects will look when completed. Drawn to scale, blueprints are valued not just for designers but for clients, who can suggest changes before construction begins that the builders can use as guidelines. Different types of blueprints enable designers and customers to visualize their plans. Elevation view drawings, or front view drawings, show how a plan will look when a person is seeing the end product. For example, the blueprints may show the front or rear of a house and the views of its sides as though the viewer were seeing it from a distance. The elevation drawings may also show how the landscaping will look against the backdrop of the house and other parts of the yard. Indoor elevation view drawings show how a kitchen, entertainment room, home office or a closet, for example, will appear when the client enters the room. Floor plans, or top views, show how things will be placed in a house from an overhead point-of-view, as if the house had no roof. With this type of blueprint, the viewer can see how walkways will flow through the house, where closets will be placed and the size of rooms compared to each other. In a single room, the client can ensure that the elements desired in the design are included. Designers can verify that walk and bend space are all going to be comfortable for the users. Isometric detail drawings, or perspective drawings, are blueprints drawn in three dimensions so that the viewer, designer and builders can see how the parts of the whole fit together. They are drawn using the perspective of the viewer and a horizon line -- showing, for example, the side and front of a house in the same picture. Multiview drawings show one aspect of design in detail, in the four quarters of a single print. The top view, front view, isometric drawing and right side drawings fill the quarters of the blueprint. The multiview shows what the completed project will look like and how much space it will require. The designer can narrow a particular facet of the project to show how it will fit into its surroundings. The right view, which is included in this blueprint, shows how the structure will look from the side.